Mesoscopic and nanoscale thermodynamics, critical phenomena, and phase transitions in soft matter. We have demonstrated that a theoretical model based on the presumed existence of a liquid–liquid critical point (LLCP) in water in the deeply supercooled region is capable of representing, accurately and consistently, all available experimental thermodynamic property data for supercooled ordinary and heavy water. By using experimental techniques such as static and dynamic light scattering and optical confocal microscopy, we are investigating the nature of mesoscopic heterogeneities of certain aqueous solution. We are also studying the effect of fluctuations on the behavior of smooth (or "fuzzy") interfaces. The examples include near-critical vapor-liquid and liquid-liquid interfaces in simple and complex fluids, interfaces in polymer solutions and polymer blends, liquid membranes and vesicles. A broader impact of this research includes filtration through microporous media in oil recovery, microfluidics, nanoscale liquid bridges, and nucleation phenomena: wherever science and technology deal with fluid droplets at submicron and nano scales. Xiong Zheng, Mikhail A. Anisimov, J . V . Sengers, and Maogang He, "Mesoscopic Diffusion of Polyethylene Oxide in Pure and Mixed Solvents", J. Phys.Chem. B DOI: 10.1021/acs.jpcb.7b10420 (November 13, 2017). Andrei A. Novikov, Anton P. Semenov, Viviana Monje-Galvan, Vladimir N. Kuryakov, Jeffery B. Klauda, and Mikhail A. Anisimov, "Dual Action of Hydrotropes at the Water/Oil Interface J. Phys. Chem. C, 121, 16423−16431 (2017). John W. Biddle, Rakesh S. Singh, Evan M. Sparano, Francesco Ricci, Miguel A. Gonzalez, Chantal Valeriani, Jose L. F. Abascal, Pablo G. Debenedetti, Mikhail A. Anisimov, and Frederic Caupin, “Two-structure thermodynamics for the TIP4P/2005 model of water covering supercooled and deeply stretched regions” J. Chem. Phys. 146, 034502 (2017). Paola Gallo, Katrin Amann-Winkel, Charles Austen Angell, Mikhail Alexeevich Anisimov, Frederic Caupin, Charusita Chakravarty, Erik Lascaris, Thomas Loerting, Athanassios Zois Panagiotopoulos, John Russo, Jonas Alexander Sellberg, Harry Eugene Stanley, Hajime Tanaka, Carlos Vega, Limei Xu, and Lars Gunnar Moody Pettersson, “Water: A Tale of Two Liquids”, Chemical Reviews 116 , 7463-7500 (2016 ). A. E Robertson, D.H. Phan, J. E Macaluso, V. N., Kuryakov, E. V Jouravleva, C. E. Bertrand, I. K. Yudin, and M. A. Anisimov, “Mesoscale solubilization and critical phenomena in binary and quasi binary solutions of hydrotropes”, Fluid Phase Equilibria, 407, 243-254 (2016). Rakesh S. Singh, John W. Biddle, Pablo G. Debenedetti, and Mikhail A. Anisimov, “Two-State Thermodynamics and the Possibility of a Liquid-Liquid Phase Transition in Supercooled TIP4P/2005”, J. Chem. Phys., 144,144504 (2016). V. Holten, C. E. Bertrand, M. A. Anisimov, and J. V. Sengers, "Thermodynamics of supercooled water", J. Chem. Phys. 136, 094507 (2012). C. E. Bertrand, J. F. Nicoll, and M. A. Anisimov, "Comparison of Complete Scaling and a Field-Theoretical Treatment of Asymmetric Fluid Criticality", Phys. Rev. E 85, 031131 (2012). 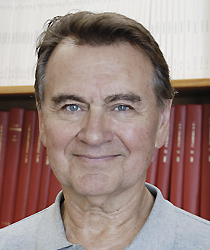 M. A. Anisimov, "Fifty years of breakthrough discoveries in fluid criticality", Int. J. Thermophys. 32, 2001–2009 (2011). D. Bedeaux, J.M. Ortiz de Zárate, I. Pagonabarraga, J.V. Sengers, and S. Kjelstrup, "Concentration fluctuations in non-isothermal reaction-diffusion systems II: The nonlinear case", J. Chem. Phys. 135, 124516 (2011). J.M. Ortiz de Zárate and J.V. Sengers, "Hydrodynamic fluctuations in laminar fluid flow. I. Fluctuating Orr-Sommerfeld equation", J. Stat. Phys. 144,774-792 (2011). C. E. Bertrand and M. A. Anisimov, "Interfacial entropy profile in the one-loop approximation", Ukrainian Journal of Physics (invited paper) 56, 779-783, 2011. C. E. Bertrand, J. V. Sengers, and M. A. Anisimov, "Critical behavior of the dielectric constant in asymmetric fluids", J. Phys. Chem. B 115, 14000–14007 (2011). C. E. Bertrand, and M. A. Anisimov, "The peculiar thermodynamics of the second critical point in supercooled water", J. Phys. Chem. B 115, 14099–14111 (2011). D. Subramanian, D. A. Ivanov, I. K. Yudin, M. A. Anisimov, and Jan V. Sengers, "Mesoscale inhomogeneities in aqueous solutions of 3-Methylpyridine and tertiary Butyl Alcohol", J. Chem. Eng. Data 56, 1238–1248 (2011). G. Pérez-Sánchez, P. Losada-Pérez,C.A. Cerdeiriña, J.V. Sengers, and M.A. Anisimov, "Asymmetric criticality in weakly compressible liquid mixtures", J. Chem. Phys. 132, 154502 (2010). D. Bedeaux,I. Pagonabarraga, J.M. Ortiz de Zárate, J.V. Sengers, and S. Kjelstrup, "Mesoscopic non-equilibrium thermodynamics of non-isothermal reaction-diffusion", Phys. Chem. Chem. Phys. 12, pp. 12780-12793 (2010). Kh.S. Abdulkadirova, C.J. Peters, J.V. Sengers, and M.A. Anisimov, "An isomorphic Peng-Robinson equation for phase-equilibria properties of hydrocarbon mixtures in the critical region", J. Supercritical Fluids 55, pp. 594-602 (2010). Mikhail Anisimov has been named a University of Maryland (UMD) Distinguished University Professor, the most prestigious internal honor on the campus. Professor recognized by ASME for work in thermophysics. Professor recognized for exemplary scholarship and research. Professor recognized by chemical engineering society for accomplishments in thermodynamics. Deepa Subramanian (Ph.D. '12) designed colloids with long-term stability. UMD professor of chemical and biomolecular engineering elected as a foreign member of both Russian Academies. Fuentevilla refines equations defining critical parameters of aqueous salt solutions. Professor Emeritus recognized at 109th Statistical Mechanics Conference. American Chemical Society grant supports new study. Grad student honored for work on organic aqueous solutions with long-term stability. Grad student invited to present current work in Santa Barbara, Ca. International Association for the Properties of Water and Steam adopts new standard as of January 2012. Event celebrates professor's 80th birthday and career in research and education. Grad student receives Gilbert Ling Poster Award for work on nanoscale inhomogeneities. Grad student presents work on self-assembly at European symposium. Exceptional students recognized by the Department, Clark School, and professional societies. Professor joins community of distinguished scholars. Anisimov group member will present work on self-assembly in St. Petersburg. Professor builds DSL lab for engineering school in United Arab Emirates. Grad students recognized for work on thesis, dissertation. Recognition at 15th International Conference on the Properties of Water and Steam. Faculty and grad students present work on properties of water and steam. Professor recognized for dedication to teaching, ethics, and supporting female students. Jingtao Wang accepts position as an associate professor. Students present research, win funding. Nariman Farvardin presides over final graduation as Clark School dean. Professor recognized for service to department and the Clark School. Professor recognized for "commitment and dedication" to teaching. Fuentevilla invited to seminar to speak on supercooling. Anisimov presents at distinguished lecture series in Japan.